Lens Description: The LUMIX G Vario 14-42mm f/3.5 Asph. / MEGA O.I.S. 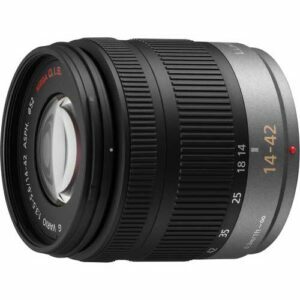 Lens with a 35mm format focal length of 28-84mm is constructed with 12 elements in 9 groups and 1 aspherical lens to produce extremely sharp images with minimal fringing and color distortion across the entire focal range. It incorporates Panasonic's Mega O.I.S. (Optical Image Stabilizer) which employs gyro sensors built into the lens to suppress the blur caused by a shaky hand, and enables capturing clear and sharp images even in low-light situations.